Dear Abby, should I feel guilty? K100-forum.com » Off Topic » Humor » Dear Abby, should I feel guilty? So I spots this flyer sort of an advert for an exhaust part that fits some unknown BMW motorbike hanging on a wall in a shop. The picture is fuzzy and the seller doesn't seem to know what he's got but he's sure it's worth some money. I ring him and we agree to meet at his place. 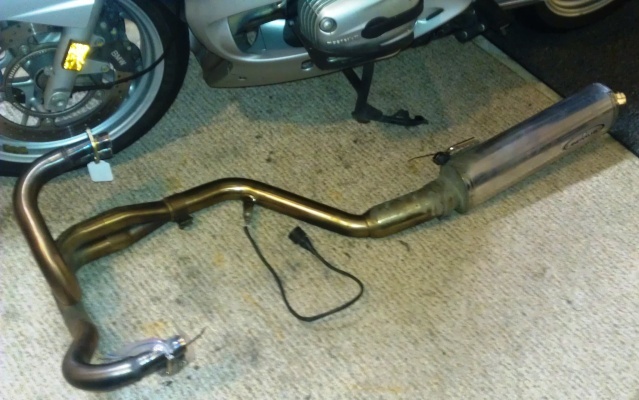 I turn up and am stunned at what I'm seeing and demurely agree to his outrageous price for this 'exhaust part'. I pay him and haul the debris away. Some people in the biz would call the three pieces a 'fat header', 'S' pipe with oxygen sensor, and an aluminium muffler, all made by Remus. I'm torn up inside. My questions are, should I feel guilty for giving him the princely sum of $150 for the pile of exhaust parts, do I really need them, and should I also be feeling sorry that it isn't exactly K bike-related? Attached is a picture of the pieces next to a BMW motorbike that they will fit. Gee whiz, I own one of those too. Zoom zoom. I'm eagerly awaiting your answer. the kind gentleman threw in these two funny-looking carbon fibre pieces because he thought they looked like they might be a part of a dryer vent and thought I might be able to use them too. As luck would have it, these two CF pieces weigh mere grams and are honking big compared to the stock intake sleeves! I don't wish to get too excited or be too technical here, Abby, but am wondering if they might supplement the exhaust flow, along with the Booster Plug and cat code jumper in the fuse box. When I measure the exhaust headers from BMW they are 36mm OD, and the piece of junk piece I bought measures 44mm OD. Thank you for any advice you can give to me. Of course you should feel guilty. This is a K forum. As penance, advance your timing by 2deg. Go for a ride and then come back and complain the bike is not running right and ask a proper question. Also mention oil and low tyre pressure. Bloody hell, I say. I miss my simple K100RS! I deserve two hail Marys and a Piña Colada. Of course you should feel guilty. As RossKo said this is a K forum and sometimes we will be gracious enough to let members talk about other motorcycles briefly however you really have a hide for putting up a post with a picture of the piece of crap you just paid through the nose for and sin of all sins you didn't even have the brains to polish it. 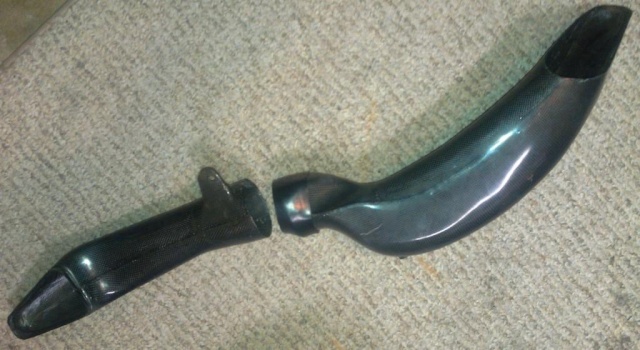 Let this be a stern warning to you ans please remember that you must be respectful to all motorcycle parts be they K or inferior types, now get out the polish and get to work.... you ......you...... Oh words fail me. You will need to start reading passages from Clymers till you feel at peace with your inner self. Either that of get a six-pack to have while fitting the piece of junk. He's just upset the NSW won the State of Orgin match I think the pennace is for him to watch 2 reruns of the game. @larrikin wrote: He's just upset the NSW won the State of Origin match I think the pennance is for him to watch 2 reruns of the game. Being overseas for an extended period of time I do try to keep up with events back at home. I know there's a new PM and I know that he's doing exactly what the pundits and naysayers said he'd do. Mr Abbott, women are wearing trousers these days. Good luck there. There's the ABC and the mostly inane, distraction-gossipy-tendency Australian newspapers. But if you knew me you'd know that I couldn't give a rat's about sporting events involving a ball being chased round a paddock by men in short shorts. I also don't subscribe to the cross-state border rivalry of some Aussies, having been born in Melbourne, raised in the Mornington Peninsula and Tassie, and for a short while, the leafy Northern suburbs of Sydney, then settling in Queensland. Who's the blue team again? Go the All Blacks!